To Nina Simone, singer-songwriter, pianist, African-American civil rights activist. From Julia Nelson. I wanted to write to you to tell you how much your music means to me. It has always felt timeless – I think that this may be because in quite a lot of cases, it has deeper political meanings. You fought so hard throughout your lifetime to raise awareness around issues of inequality, be that racial or gender based. You garnered a reputation as a difficult woman to work with – men who demand artistic satisfaction often aren’t talked about in this way. I feel that you were given a rough ride in this regard, yet you never wavered from your beliefs – if anything, it made you stronger and more resilient. Your songwriting abilities absolutely inspire me and reaffirm my belief that music should move and empower people, as well as to have the potential to impart powerful meanings and potentially change attitudes. 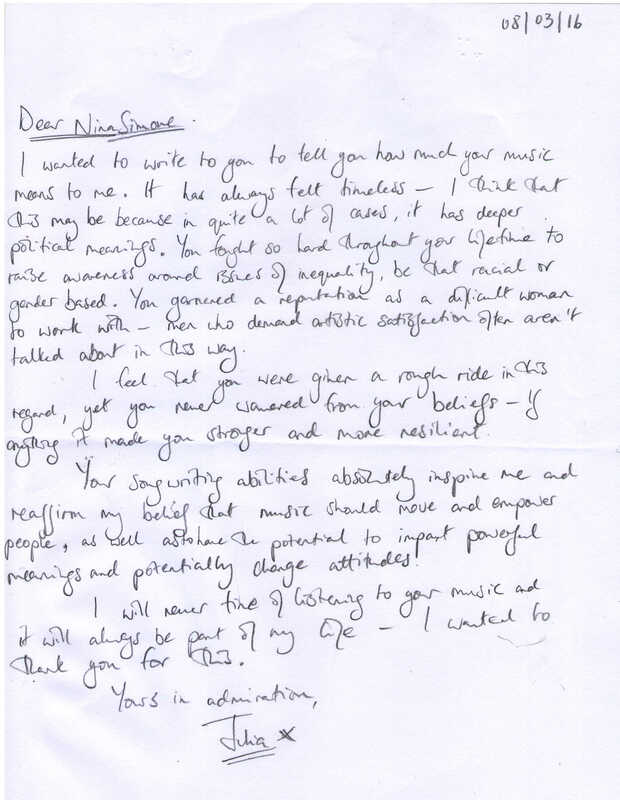 I will never tire if listening to your music and it will always be part of my life – I wanted to thank you for this. singer-songwriter, pianist, African-American civil rights activist. Born 1933, died 2003. More information about Nina Simone.